A five-year project to restore a village’s own railway locomotive which worked during the ironstone quarrying days has received a cash boost thanks to a recent auction. The 50/50 auction saw sellers offer half of the ‘hammer’ price of items to the conservation of ‘Lord Granby’ - a locomotive that worked in Eastwell from 1902 to 1959 for the Eastwell Ironstone Company. Funds raised will be used for the substantial engineering work required to restore ‘Lord Granby’ to static exhibit status as the central attraction of a future ironstone heritage centre. Despite working on a shoestring a great deal of work has been done so far by hard-working and professional volunteers. The locomotive has now been completely stripped down in the workshop ready for re-building. 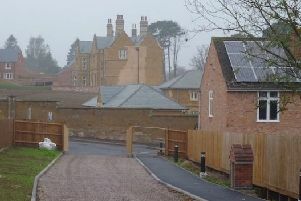 People will be able to see the progress made for themselves by attending a free-to-enter open day at the workshop, next to Dove Cottage Day Hospice in Stathern, next Saturday (August 13) from noon. There will also be a barbecue, licensed bar and cream teas, an audio visual presentation of ironstone quarrying in Eastwell and district in the 1960s and before, vintage tractors and classic cars and a fully working miniature steam railway. John Wood, honorary secretary of the Eastwell History Group, said: “We’re very grateful to everyone who helped make the 50/50 auction a worthwhile day, from the sellers and buyers to the porters and caterers and particularly to our auctioneer, Peter Benson, who worked at the rostrum continually for over three hours.